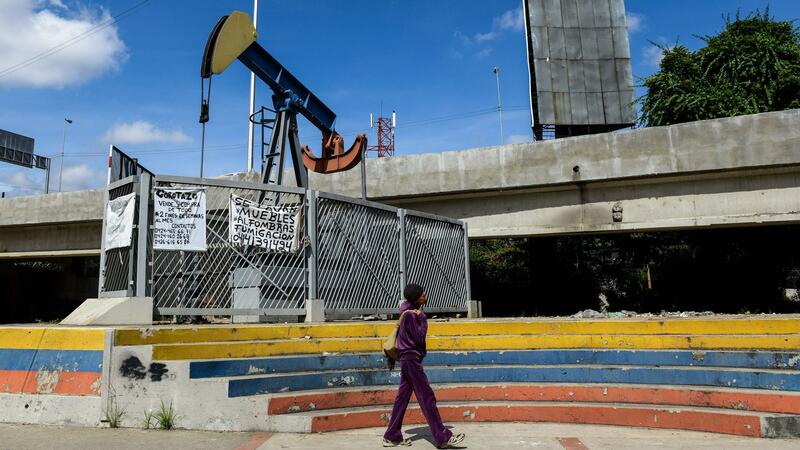 A woman walks past an oil pump in Caracas earlier this month. Part of Venezuela's fiscal woes arises from lowered gas prices worldwide — a huge hit to an economy so reliant on its oil production. For a span of some four months earlier this year, demonstrators swarmed Venezuela's city streets in protest of ballooning inflation, diminishing food and President Nicolas Maduro's tightening grasp on power — until, that is, Maduro's efforts to derail the opposition bore fruit. By August the protests ebbed from view, as a new lawmaking body packed with Maduro's preferred politicians took the country's reins. Still, while the protests have all but disappeared, the economic woes that helped inspire them remain as obstinate as ever. On Tuesday, the credit ratings agency Standard & Poor's said Venezuela has failed to make interest payments totaling $237 million this week, adding to creditors' list of grievances against the country. The announcement comes just a week after ratings agencies declared Venezuela's government and its state-run oil company, Petroleos de Venezuela, in default on some debts. All told, it's estimated that Venezuela owes around $140 billion in total external debt. Meanwhile, CNN reports that Venezuela's currency has lost 96 percent of its value this year alone. Citing the currency tracker DolarToday, the network notes that the exchange rate was at about 3,100 bolivars to a U.S. dollar; as of this week, it would take 84,000 bolivars to equal that dollar. Steve Hanke, a professor of applied economics at Johns Hopkins University, places the inflation rate at 4,115 percent. "The economy is really in a complete death spiral," Hanke told the network. "It's gotten a lot worse there in the last two weeks." Maduro — who has said he plans to "refinance and restructure" the country's external debt, according to the BBC — has laid the blame for these economic woes largely with "imperialists" such as the U.S., which sanctioned his regime and labeled him a "dictator" this summer. His top prosecutor Tarek William Saab, who replaced a woman who had grown increasingly critical of Maduro, has also lately embarked on what he calls an "all-out fight to clean up the oil industry," as quoted by Bloomberg. That includes detaining six high-ranking executives at Citgo, a subsidiary of PDVSA based in the U.S., including the company's acting president. Reuters reports that Asdrubal Chavez, cousin of late leader Hugo Chavez, had been chosen to head the U.S.-based refiner on Wednesday. The executives are suspected of "embezzlement stemming from a $4 billion agreement to refinance company bonds," the Associated Press reports. But they're not the only ones to draw the ire of the prosecutor's office, which the AP says has made nearly 60 arrests on corruption allegations. "While I'm working hard every day, there's a group of bandits stealing from the people," Maduro said in a televised address Tuesday, according to the wire service. "What's that called? Treason." "The water is up to their noses," Luis Alfonso Soler, a former PDVSA executive, told Bloomberg. "The work that William Saab is doing is absolutely necessary, but it has to be complete. At this point, we don't know if it's only a matter of retaliation." And it's unlikely the country will find its ladder out of economic ills in the hands of the prosecutor alone. 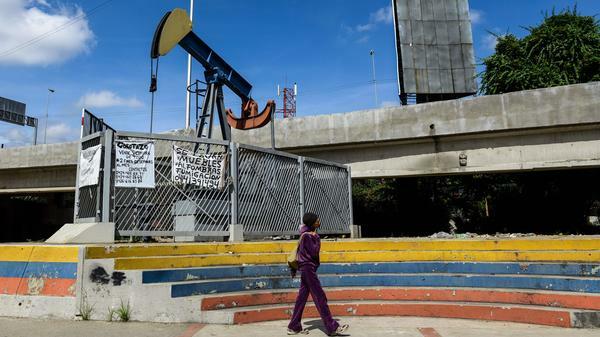 Venezuela's earnings on oil exports, which the BBC says constitutes about 95 percent of its total foreign earnings, have dropped to about a quarter of what they were even five years ago. "Oil windfall is a gift that you sometimes get, and you should never really manage it as if it is going to be there forever," Jan Dehn of Ashmore Investment Management told the British network. "The money should be invested so you can generate benefits that are lasting — education, infrastructure investments, improvement in healthcare. But Venezuela has done nothing of the sort." The result has been a devastating food shortage. A university survey cited by The Guardian notes that nearly 75 percent of Venezuelans have lost weight in 2017 — some of whom reported weight loss as vast as 78 pounds. As NPR's Philip Reeves reported in September, Maduro has blamed the crisis — again — on foreign "imperialists." And he offered one unusual solution to sate Venezuela's rampant hunger: eat rabbits.